A model of consistency, Eddie Murray played more games at first base than any other player in baseball history and his final stats put him in a very exclusive group. 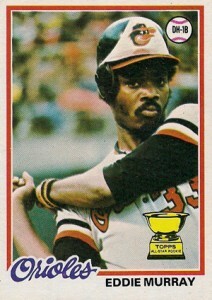 Adding to that, his dependable bat and strong defense helped the Baltimore Orioles claim a World Series crown. 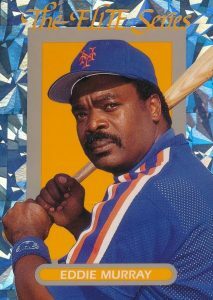 This top list features some of the most notable Eddie Murray baseball cards and includes releases from all phases of his lengthy career. By the end of his career, Murray had become the third player to ever notch more than 3,000 hits and 500 home runs. He was in good company as the other two players were Hank Aaron and Willie Mays. He was also the RBI leader for switch-hitters and was behind only Mickey Mantle in home runs. There was little doubt that Murray would be headed to Cooperstown, and he was elected on his first ballot in 2003. 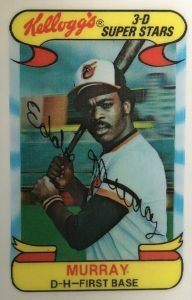 Shop for Professionally Graded Eddie Murray cards on eBay. Because of the sheer number of Eddie Murray cards, not all can be featured in the list below. However, several are still worth noting. Among his many cardboard choices, one well-known error card that features Murray can be found in 1990 Bowman. The set is notorious for misprinted card backs that featured different player information than the player on the front. 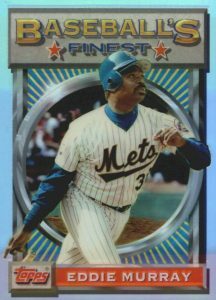 Offering a classic example of this, the Barry Bonds' card features a smiling Bonds on the front with Murray's stats on the back. 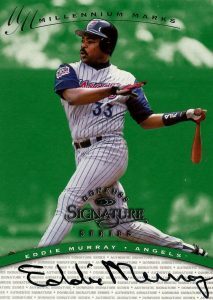 As the famed Eddie Murray rookie card includes the Topps All-Star Rookie Cup, Murray collectors may also want to try to build the rainbow of Rookie Cup parallels in 2005 Topps. This includes red, orange, yellow, green, blue, silver, and gold parallels, and there are even Chrome reprints. 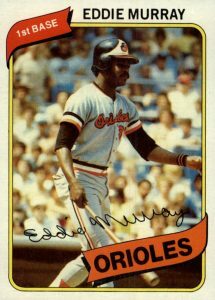 The list of the top Eddie Murray cards includes some limited edition releases from the junk wax era and also some key early cards from the end of the 1970s. In building this top list, card value, design and the card's popularity with collectors were all taken into account. In 1985, Topps and O-Pee-Chee were testing new printing techniques and decided to make a slightly smaller version of a seemingly random assortment of 132 cards from the 1985 Topps checklist (including Murray's card #700). The cards are printed on white card stock, so the coloring seems much more bright and vivid than the standard 1985 Topps issue. Although these cards were never officially released as their own product, copies have become available on the secondary market including some versions that have a blank back. 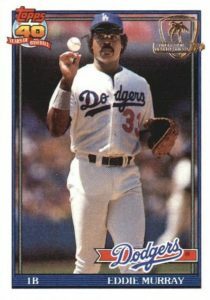 Murray played for his hometown Los Angeles Dodgers for parts of four seasons and the 1991 Topps card with him casually throwing the ball was also included in the limited series of cards produced for members of the Desert Storm military action. It is thought that about 6,800 sets were created, with some making their way to Iraq and some becoming available at military commissary shops. The cards are easily spotted by the foil stamp in the top-right corner, and they are certainly the most valuable version of 1991 Topps for collectors to track down. Murray's third-year card from 1980 Topps lets us know on the reverse side that Murray and his four brothers all played some type of professional baseball. This includes his younger brother Rich Murray, who played first base for the San Francisco Giants from 1980 to 1983. You can find a card for Rich in 1981 Topps and as well as in many other minor league card sets from the early 1980s. Following the success of the Elite insert set in 1992 Donruss, the brand again included 20 of these hard-to-find cards in 1993 Donruss. Each of these foil cards was serial numbered to 10,000 copies and Murray's card features him during his time with the New York Mets where he continued to be productive by nearly driving in 100 RBIs during each of this two seasons with the team. When collectors ripped into boxes of 1993 Topps Finest they were in for a surprise as they would find very limited Refractors at the rate of two per box. As the regular Finest base cards were shiny themselves, it was easy to overlook the Refractors that they might have pulled. Topps was introducing new card printing technology with the set and on the reverse side of the cards, they famously included the patent numbers used in the new printing technology. All five of the Hostess sets that were released in the last 1970s were pretty similar in their design, and the 1978 set features the player's name, team, and position towards the bottom of the card. In terms of value, it varies greatly from each three-card panel to another and is dependent on which product that panel was included on. Panels that were featured on less popular Hostess products were never cut out and saved and so their availability is much lower. 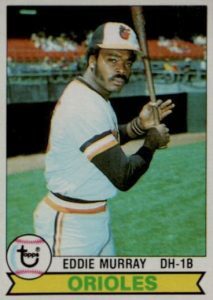 Murray's panel, which he shares with San Francisco Giants pitcher Gary Lavelle and Pittsburgh Pirates infielder Rennie Stennett, was one of the rarest panels, and it is the hardest to find of Murray's three cards from 1978. 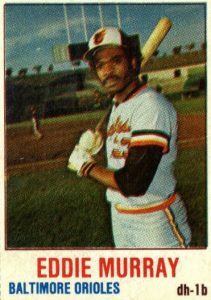 The second-year card for Eddie Murray can be found in 1979 Topps and the back of the card illustrates that Murray didn't have a sophomore slump as he met or surpassed his Rookie of the Year season statistics, including his totals for home runs, RBIs, and batting average. One category that Murray would become the all-time leader in was sacrifice flies, and he recorded 128 over the course of his career. Although the base autograph in the 1997 Donruss Signature set has a red background, Murray only appears in the more limited Millennium Marks autograph insert set which has a green background. This first certified autograph for Murray is limited to 900 copies, and his signature is known for its clarity and slant to the left. 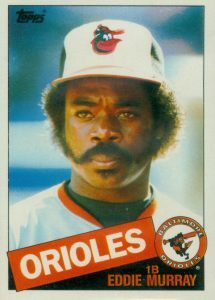 Murray's rookie year card from 1978 Kellogg's 3-D holds the top spot for value in the 57-card set which was available in cereal boxes as well as a mail-in option. Over time, mint copies of the Kellogg's card have become very difficult to locate as the printing process used to create the 3-D cards becomes brittle and cracks easily. The 1978 Topps Eddie Murphy rookie card is among the key cards from the set (along with Paul Molitor and Alan Trammell's shared card) and it is one of the most highly sought-after cards of the decade. Rarely do players make their first appearance on a Topps card and also earn the All-Star Rookie Cup at the same time. This makes the card popular for collectors of All-Star Rookie Cup appearances and highly-graded versions can top $500 at auction. 2002 Stadium Club World Champions Eddie Murray GU Jersey Orioles *FREE SHIPPING!